Meet two charming beach birds – Pelican and Pelicant. Even with similar names, telling them apart is easy – one eager and self-confident, the other nervous and shy. Fly with Pelican to the top of an enormous oak. Laugh as she shows newcomer Goose around the island. Float in the waves with Pelican while she rests after an enormous fish dinner. Finally, go with her to Turtle’s party to dance the Pelican Pop-up and dine on crab birthday cake with crayfish frosting. But where is Pelicant during all of this fun? Watch self-esteem blossom in the face of uncertainty and risk-taking. Discover what happens when these endearing pelicans look beyond feathers and beaks to the tender roots of a genuine friendship. Young people will find Sarah Froeber’s tale delightful and engaging, and adults will recognize the rich texture of a time-tested myth. Kim Mosher’s illustrations in luminous colored pencil are simple yet detailed enough to tell this story on their own – the closer you look, the longer you will giggle. 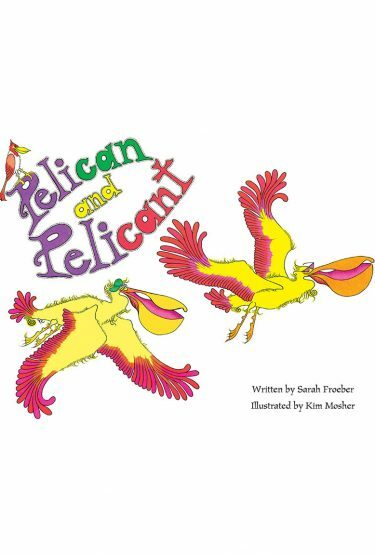 Kim Mosher was certainly a PeliCAN when illustrating this magical boo! Drawn entirely by hand, the superb and highly detailed color pencil illustrations visually tell the story. Kim recently illustrated My Rainy Day Cat written by her husband Kevin McCabe. You can learn more about Kim and her color pencil art by visiting www.kimmosherdesigns.com.